The Equipment and Engine Training Council (EETC) held its 22nd Annual Conference April 11-14 at the Hotel at Auburn University & Dixon Conference Center in Auburn, Ala. A non-profit organization dedicated to offering a wide array of training resources to current and potential power equipment technicians, and a certification testing system for service technicians in power equipment dealerships nationwide, EETC makes its materials available on its website (eetc.org) and at GIE+EXPO. The big news this year is the EETC Board voted to move toward all on-line testing, without proctors, in the future. Look for more details soon. As is the case each year, EETC Certification Committees met to update certification tests by discussing and writing new questions to be added to the existing test banks. Committees updated tests in five areas: compact diesel engine, 2-stroke engine, 4-stroke engine, electrical systems and driveline systems. Representatives from various manufacturers worked together in friendly cooperation to come up with new test questions for training service technicians at dealers. “The neatest thing about this organization is, we are not competing with each other here,” says Stihl’s Eddie Anderson. Attendees not participating in those committees had the option of touring the nearby Briggs & Stratton manufacturing plant on the morning of April 12. That afternoon, sponsors presented several special presentations. Husqvarna offered a look at its newest fourth generation (300 and 400 series) Automower line. Toro’s Duane Kasprick says he wanted to present something a little different at EETC this year—drive systems. “Seems like we hear a lot about carburetors, engines and electrical,” he notes. The overview he gave on walk behind drive system technology, he says, is good for Toro machines as well as other brands. Oregon offered a seminar on blade sharpening. And Top Equipment presented its Carburetor Life fuel system cleaning kit. 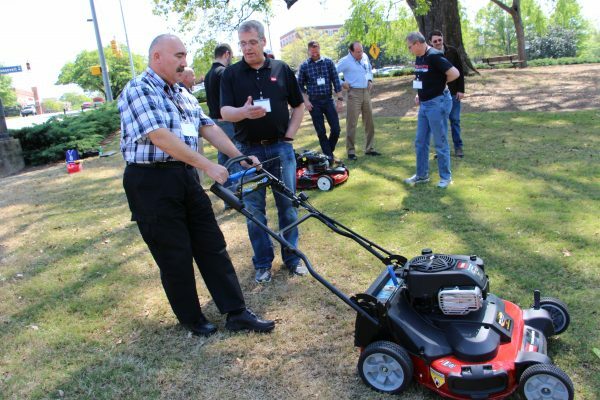 On the following day, Briggs & Stratton presented on 4-stroke engine troubleshooting, while Echo offered a program about advanced engine diagnostics and Stihl offered a look at diagnostic tools and injection. For more information, contact Executive Director Erik Sides at [email protected] or at 803-322-1410, or visit eetc.org.